SP Setia Bhd, one of the country's biggest developers, is investing up to RM30 million to set up an integrated rail transport hub at its RM6 billion KL Eco City mixed development in Kuala Lumpur. The company is building a KTM commuter station, which will be integrated with the existing Abdullah Hukum light rail transit (LRT) station at the project location by 2013. Executive vice president Richard Ong said SP Setia is finalising the design proposals for the KTM station with the rail authorities. "Subject to the authorities' requirements, the KTM station is estimated to cost around RM30 million," Ong told Business Times. 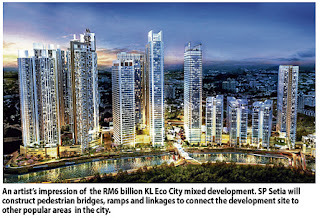 SP Setia, via its unit KL Eco City Sdn Bhd (KLEC), is developing KL Eco City on the former Kampung Haji Abdullah Hukum site at the end of Jalan Bangsar. The 10-year development will comprise several residential towers, offices and a 5.7 million sq ft retail podium. Ong said KLEC has began preliminary site works such as earthworks, tests piles and relocation of existing utility services, including realignment of Sungai Pantai (river diversion works). Substructure works such as piling and foundation are expected to commence in two months, said Ong, who is also KLEC project director. Ong said these are part of the construction works for Phase One of the project, comprising 12 blocks of boutique offices, a strata office and a corporate office tower on a four-storey retail podium, worth almost RM2 billion. SP Setia will construct a pedestrian bridge linking KL Eco City and The Gardens at Mid Valley City to enhance the development. Meanwhile, SP Setia will invest RM150 million to link KL Eco City to the Federal Highway via two dedicated ramps. The ramps will enable traffic heading towards Petaling Jaya and Kuala Lumpur to gain direct access into KL Eco City and to exit the development directly onto the Federal Highway. There will also be linkages to Jalan Maarof in Bangsar via Lingkaran Syed Putra. KL Eco City will also have direct access to and from the New Pantai Expressway (NPE) via the existing Jalan Pantai Baru and Jalan Bangsar interchange. Ong said SP Setia has procured all the necessary approvals from the relevant authorities on the design proposals for the ramps and the linkages. "Tenders have been called and the evaluation process and award is expected to be completed in the next two to three months," he said. HONG KONG: Singapore-based shopping centre developer CapitaMalls Asia said yesterday it would spend US$365 million (RM1.12 billion)to develop a mall in southern Beijing, buying the land from a subsidiary of the Poly Real Estate Group. The development will feature a seven-storey, 122,000-square-metre mall, representing a total cost of around 19,190 yuan per square metre (RM9,319) for construction and land, the company stated. The project is due for completion in 2015. CapitaMalls Asia, 65 per cent owned by Temasek, is one of the most active international property developers in China. This will be its 57th mall in the country. KUALA LUMPUR: TA Global Bhd, the property arm of stockbroker TA Enterprise Bhd, has entered into a sale and purchase agreement with Kingdom Hotel Investments to acquire Movenpick Karon Beach Resort in Phuket, Thailand for RM276.93 million. TA Global's board of directors said in an announcement to Bursa Malaysia that the freehold property comprises a four-star hotel with 175 guestrooms, 163 suites and villas and 30 beachfront two-bedroom apartments on 20.46 acres. They said the acquisition would further enhance the company's hospitality operations in major cities around the world and expand the existing portfolio of hospitality properties into Thailand. They added that the acquisition would provide steady revenue stream and enhance the revenue contribution from the hospitality division. Almost complete: The RM38mil terminal is about 90% complete and is expected to be operational in mid-June. A PLAN is in the pipeline to redevelop Medan Kidd in Ipoh to improve the public transportation system. Perak Transit executive chairman Mohamad Mat Isa said the area around the rundown Medan Kidd bus station and the Ipoh railway station would be redeveloped, to ensure better service for locals and tourists. “We are planning to build covered walkways between the bus station and railway station. Mohamad added that the Medan Kidd bus station would be demolished to make way for a new structure under the whole project themed “Ipoh Central”. “Everything is still at the early stages,” he said, adding that the cost for the whole project has yet to be determined. “We will also build shophouses for food and souvenir traders,” he said after visiting the new RM38mil Ipoh Integrated Bus Terminal and Complex with state executive councillor Datuk Dr Mah Hang Soon in Bandar Meru Raya, recently. Dr Mah said the inter-city Ipoh Integrated Bus Terminal and Complex was now 90% complete. “It is expected to be completed ahead of schedule and operational by mid-June,” Dr Mah added. 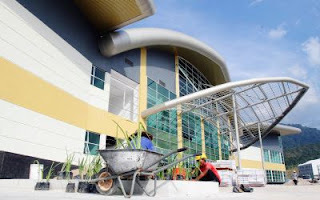 The three-storey terminal and complex by Combined Bus Services Sdn Bhd (CBSB) is built on a 3.4ha plot of land. The project, which began in 2010, consists of a business centre, food court, basement car park and petrol kiosk. It would serve as an inter-city bus terminal to connect the Ipoh central bus station via shuttle bus service. “The complex can accommodate between 8,000 and 10,000 people in full capacity,” he said, adding that it was surrounded by the Mydin hypermarket, Taipan City project and other shops. 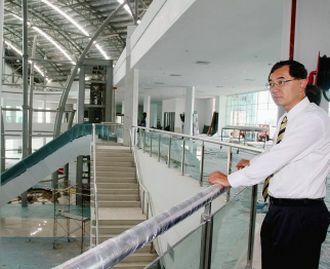 Spacious: Dr Mah checking out the terminal’s interior during his visit. Dr Mah added the complex could house around 60 buses. On concerns that the complex was situated far away from the city centre, Dr Mah said there would be feeder buses and taxi services to ferry passengers to and fro. “As for Medan Kidd station, it will be a hub for inter-town transit, complementing the complex,” he said. On Medan Gopeng’s status with the opening of the complex, Dr Mah said a letter had been submitted to the Land Public Transport Commission (SPAD) to determine its fate. “It will be convenient and practical for Ipoh to just have one inter-city bus terminal and we hope all bus companies will cooperate with us,” he said. PETALING JAYA: Iskandar Investment Bhd (IIB) has entered into a collaborative agreement with MCT Consortium Bhd to discuss the latter's proposed investment in Medini Iskandar, Nusajaya. IIB said in a statement that the agreement would be on developing small-offices-home-offices (SoHos) or studio units, a hotel and a boutique retail gallery. Details on MCT's investment in Medini have yet to be finalised. IIB president and chief executive officer Datuk Syed Mohamed Syed Ibrahim said MCT's presence would complement efforts in the transformation of Medini Iskandar into the central business district of Nusajaya, which lies in the heart of Iskandar Malaysia. MCT group founder Datuk Sri Barry Goh said: “We are excited about this project. Nusajaya is not only strategically located in the heart of Iskandar Malaysia for business convenience, waterfront lifestyles and international connectivity but also stands on strong pillars of catalytic, entry-point projects such as EduCity, Medini Iskandar and Legoland Malaysia, in addition to Pinewood Iskandar Malaysia Studios and Gleneagles Medini, etc. MIDF Research upgraded Sunway Real Estate Investment Trust (Reit) to "buy" after the latter’s latest earnings result exceeded market expectations. “Our forecast had underestimated the growth of the hospitality segment which had surprisingly registered commendable growth in a challenging economic environment,” the broker said in a research note on Thursday. MIDF raised its target price for Sunway Reit to RM1.39 per share from RM1.36 previously, while it lifted the Reit’s earnings forecast for the fiscal year ending June 30, 2012 by 6 percent. By 10am , Sunway Reit shares rose 2.42 percent, outperforming the Malaysia’s benchmark stock index that climbed 0.08 percent. KUALA LUMPUR: Sunway Real Estate Investment Trust's (SunREIT) unit SunREIT Capital Bhd has issued RM850mil in nominal value of commercial papers (CPs). It said on Thursday the CPs were accorded a short a short term rating of P1(s) by RAM Rating Services Bhd. The RM200mil CPs, will be under a competitive tender, have a tenure of three months and will mature on July 25. The other RM300mil in CPs would have a one-month tenure and will be placed out while the RM350mil CPs, which would also be placed out, would have a tenure of three months. PETALING JAYA: Sunway Real Estate Investment Trust (Sunway REIT) net property income (NPI) rose 21.9% year-on-year (y-o-y)to RM74.3mil in the third quarter ended March 31, 2012, on stronger assets contribution. Sunway REIT's NPI for its initial portfolio of eight assets expanded by 9.6% y-o-y with Sunway Pyramid Shopping Mall's NPI grew 12.3% for the quarter under review compared with the previous corresponding period, it said in a statement. Distribution income rose 10.4% y-o-y to RM50.4mil, translating into quarterly distribution per unit (DPU) of 1.87 sen. For the nine months period, it declared DPU of 5.61 sen translating into annualised distribution yield of 6.0% based on Sunway REIT's unit closing price of RM1.25 as at March 31.